An ice cream is thrown; A Mosquito enters the sewer; A bottle cap on Yellow makes him tapdance. The race of the three slowpokes; Yellow is snoring; A popcorn; A beautiful goldfish in a plastic bag. Bubble wrap catches their eyes; Red turns into a cocoon; Red is having a nightmare; Red is trapped in a pudding. Larva relax in a puddle; Larva play hide and seek; Yellow blows a bubble; Some liquid falls onto Yellow's head. A frog appears; A strong wind blows; Red has a toothache; Larva toss a coin; Red and Yellow eat food on the ground. Red and Yellow get stomach aches; A coffin shaped box stands up and the lid opens; The bee hive. Larva are covered in cement; Navi from Avatar; Earphones fall into the drain; Yellow catches a cold. Yellow finds a glove; Brown loves dung; Red and Yellow can't see; Red eating a pizza; A blond wig falls. Violet is falling in love; Super glue; How dangerous a swing can be; Yellow starts growing a plant; Bee is making honey. Green liquid; Fruits, beverages, and his loving sausage; A soft chick is born; A problem of farting; Rainbow is a snail. Everybody wants the sausage! ; Yellow's nose hair; The Mantis; A strong wind; Red fruit looks delicious. 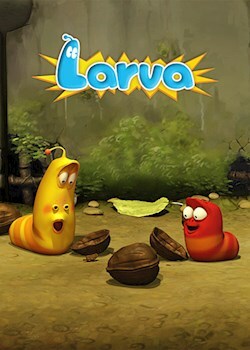 Larva in Avatar; A remote control toy; Pink is sick; Pink changes into a cocoon; Who will be the winner of Jelly? ; Dangerous power lines. A fire in the drain; Fish with scary teeth; A tantalizing cherry; Yellow wants to fly; Octopus has eight legs; Red and Yellow turn into cocoons.